.Dates used: 1954 - 63? helmets to find. I know the picture at right doesn't have an orange bill and the logo is different, but these old helmet photos are hard to find. Thoughts: This was part of the home uniform during the '63 season. Next to my New York Giants helmet, near impossible to find. Thoughts: Are you out there somewhere? there can only be one name that comes to mind . 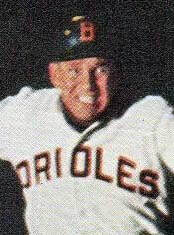 . . Brooks Robinson. all the way, but don't forget the quiet one . . . Eddie Murray. Thoughts: Another of the Retro helmets from Fotoball put out in 2003 but it was actually used for a period of time. Not too bad of a helmet design. Dates used: Never, as far as I know, but the Orioles did wear a cap like this in the 1975-76 season. helmet was only used for one year. If you look really close at the bird's head and compare it to the 2nd helmet below you'll see a slight variation in the overall design. I'm still trying to find a player wearing this helmet. Thoughts: This helmet was also only used for one year. If you look really close at the bird's head and compare it to the helmet below you'll see a slight variation in the overall design. Thoughts: This was the primary logo for quit some time. Again, notice the differences from the helmet that is two above this one. Thoughts: This is the same as above but the logo on this helmet is really, really small. Thoughts: They just need a bigger logo on this helmet. Thoughts: Was a promotional item but the Orioles did wear this helmet. The bill color is a darker orange, it's just a bad photo. Thoughts: This is the current helmet. Notice that the bird's cap now has an "O's" above the bill instead of the little orange blob in the early 80's models. Thoughts: This is also the current helmet. Notice that the bird's cap now has an "O's" above the bill instead of the little orange blob in the early 80's models. I haven't been able to find one, so I just made this one from the helmet above. Thoughts: Just a promotional helmet.